Find a scent for a girlfriend or wife with these popular perfumes in designer brands. The best perfume scents may be a classic fragrance or modern. Most women love fragrances as they can have a positive impact on mood and confidence. Giving a sensual perfume by a designer or celebrity will remind a partner of you whenever it is worn. Knowing the popular perfumes can help to find a scent that is perfect for a significant other. Princess by Vera Wang – A popular perfume for teenagers and women in their early twenties. 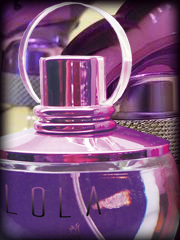 The oriental floral fragrance comes in a stunning heart-shaped bottle showing off the lilac perfume. The scent contains water lily, apple, mandarin, guava, Tiare flower, tuberose, chocolate, vanilla, amber and wood. Flower by Kenzo – This perfume won the 2002 “Women’s Fragrance of the Year – Popular Appeal” category in the FiFi awards. The scent contains parma violet, wild hawthorne, cassis, rose, vanilla, white musk and opoponax. Lola Conquest by House of Fragrance – Strength. Femininity. Sensuality. A deep heart of Molten Woods, Pine and Patchouli, surrounded by rich Florals including Spiced Lily, Exotic Rose and other night-blooming florals. the scent contains:STRENGTH: Exotic Rose, a symbol of passion is prized for its seductive beauty and exquisite scent. Blended with the subtle sweetness of Rose Essence, Strength of Jasmine Queen of the Night lends its velvety petals and woodsy aroma to the opening notes. A rush of Black Pepper brings a spicy vibrancy to this tempting bouquet. FEMININITY: An enticing heart centered around a core of Melted Woods Nature Print, yields a sleek, feminine woody signature that is unmistakably unique. Luscious and captivating Pine Accord enhances the enticing presence and smooth sensation. Patchouli Prisma is richly faceted, yet earthy and elusive. Perhaps the most sensual of flowers, the Spiced Lily offers its nectar to butterflies and bees, and envelops the heart in a hypnotic midnight garden effect very feminine. SENSUALITY: Wrapping your senses in luxurious sensuality, precious Benzoin and creamy Vanilla add texture and warmth. A drizzle of rich Honey and glowing Amber reveal a luminous opulence that lingers throughout this dark and sensuality blend. Joy by Jean Patou – This floral is made from no less than ten thousand jasmine flowers from Grasse and 28 dozens of aroma roses (as well as tuberose, ylang ylang and synthetic musk) to create 30 ml of perfume. Joy became the second bestseller perfume in the world after Chanel No 5 and is said to have been worn by Marilyn Monroe and Jackie Kennedy-Onassis. Stella Rose Absolute by Stella McCartney – A lovely rose fragrance, with citrus, peony and amber. This version is like an intensified version of the original. The scent has be reported to be worn by Alicia Keys and Isla Fisher. Lola Cherish by House of Fragrance – has Feminine, intensely rich, mysteriously seductive, but with a more luminous, fresher signature. FEMININE: Vibrant and sensual, Cherish is fresh, floral and woody, like nectar of voluptuous flowers, trailing delicately but still present a very powerful feminine touch, the sparkle of Neroli with a touch of raspberry reveals the first breath. SEDUCTIVE: But then the lethal weapon of heady absolute orange blossom slips out of its sheath. Its narcotic sweetness bewitches its sheath and grabs all attention powerfully very seductive. Then, joining with absolute Arabian jasmine underlined by gardenia, the blend soars into something more carnal, yet ever subtle. MYSTERIOUS: Now the obsessive pulsing of patchouli enters the fray, pacifying the honey with an addictive and terribly tempting sweetness. Mystifying blend Raspberry spreads to become all enveloping, floating around the beauty, following each movement. Carnal Flower by Frederic Malle – The perfume contains tuberose, bergamot, eucalyptus, ylang-ylang, jasmine, orange blossom absolute, coconut and musk. The muse for this perfume was Candice Bergen (Malle’s aunt) who acted in the movie Carnal Knowledge. This is a good gift for women who like something special as it is exclusively available from Les Senteurs. Lola Cherish by House of Fragrance – This oriental scent comes in a bottle that will make any dressing table look glamorous. The smell features many ingredients including raspberry, neroli, lemon, jasmine, orange flower, gardenia, patchouli and white honey. Safari for Women by Ralph Lauren – A nineties fragrance that symbolizes the spirit of freedom and adventure. Safari is a green floral with galbanum, mandarin and hyacinth; heart notes of rose, lily of the valley, narcissus and iris; and base notes vetiver, moss, Tonka bean and styrax. Shalimar by Jacques Guerlain – Made in 1925 as a tribute to the love story between Emperor Shah Jahan and his wife Mumtaz. Shalimar contains lemon, bergamot, jasmine, may rose, opoponax, Tonka bean, vanilla, iris and gray amber. Twitch Jasmin Rosa by House of Fragrance – This floral fruity scent comes in unique fashionable stylish twisted bottle that will definitely make any dressing table look more seductive and glamourous. The features of smell many ingredients including e.g. peony, pineapple, cassia, jasmine, litchi, musk, white tea, tobacco, teak wood, tonka bean and sandalwood. Use the above romantic gift ideas to find the best perfume for your partner. Many popular perfumes used for gifts come from designer brands though older classics are special due to their exclusivity. LuxeMag.org Joy Perfume by Jean Patou as a Symbol of Hope (Accessed December 10, 2010). TheIndependent.co.uk The 50 Best Fragrances (Accessed December 10, 2010).